Scroll down to discover how refugee movements have changed in Sudan and South Sudan. Sudan and South Sudan are major countries of origin in the Great Horn of Africa region. Sudan’s history has been affected by internal conflicts caused by powerstruggles between the central government and the many tribes and groups in marginalized regions. South Sudan is the youngest nation in the world. But instable power relations are the reason that it is also one of the countries with the highest rates of conflict-induced population displacement. Death rates caused by starvation are high in both countries. This is due to natural disasters such as flood and drought in combination with various conflicts. In 1989, the refugee population from Sudan was 450,000. After a sharp decrease, it reached 100,000 in 1991. Between 1991 and 2006, the refugee population from Sudan increased sharply, from 100,000 to 680,000. After the end of the Sudanese Civil War and the war with Chad, the Sudanese refugee population decreased to 380,000 in 2009. Still, many Sudanese remained displaced due to tribal conflicts and a devastating flood in 2007. 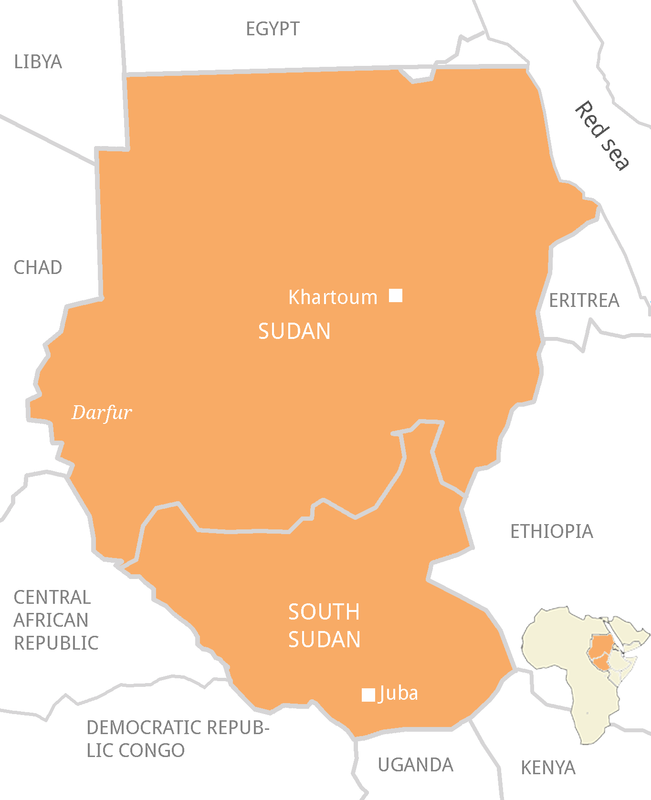 In 2011, Sudan split up into the Republic of Sudan and the Republic of South Sudan. Various conflicts led to an increase in Sudan's refugee population from 380,000 to 650,000 in 2013. Between 2011 and 2013, the South Sudanese refugee population increased rapidly from 7,000 to 120,000. Today, this is one of the most virulent contemporary refugee crisis. The 650,000 Sudanese refugees in 2013 obtained asylum in Chad (350,000), South Sudan (210,000), Ethiopia (33,000) and other countries (55,000). The 120,000 South Sudanese refugees in 2013 obtained asylum in Ethiopia (73,000), Uganda (22,000), Kenya (20,000) and other countries (5,000). In 1990, the number of foreign refugees in Sudan peaked at 1 million. Thereof, 860,000 originated in Ethiopia, 130,000 in Chad and 10,000 in other countries. These refugees were gradually replaced by Eritreans who numbered 430,000 in 1993 and 108,000 in 2013, consistently making up around two thirds of the total foreign refugee population in Sudan. Sudan’s history has been continously affected by internal conflict. First, because of violent tensions between the central government and the many tribes and groups in marginalized regions in Sudan. Second, because of an ethno-religious component of the conflict. Since 1983, the government has been trying to impose Muslim Sharia law on the non-Muslim South Sudanese population. The Second Sudanese Civil war (1983-2005) is widely seen as a continuation of the First Sudanese Civil war, which ended in 1972. It involved the Sudanese Central Government and the southern Sudan’s People’s Liberation Army (SPLA), amongst others. The peace negotiations began in 1986 under Sudanese Prime Minister Sadiq al-Mashdi. The crucial demand of the SPLA and other opposition actors was the abolition or at least the freezing of the Sharia Law as the national legal code. In 1989, a new military government under Omar al-Bashir came to power trough a coup d’etat. This ended the peace process, which was at a critical point. In 2003, the Second Sudanese Civil war raged on as the Darfur War began. Non-Arabic guerilla guerilla rebel groups and the government of Sudan set off a conflict in the western Darfur region, an area mainly inhabited by a non-Arabic population. The war claimed hundreds of thousands of civilian victims and millions of people were displaced by the Sudanese Government's subsequent war crimes. Between 2005 and 2007, the Sudanese Government entered into yet another war with Chad. In 2005, the Second Sudanese Civil War was formally resolved by a peace agreement. In 2011 this led to South Sudan’s independence after a popular referendum. On the matter of Darfur, peace negotiations in 2006 and 2011 resulted in bring peace agreements, but not in any notable progress in the matter. Human casualties in the two countries still remain high. Early 2010: A new internal conflict in the southern Sudanese provinces of South Kordofan and Blue Nile breaks out. The warring parties include the Sudanese Army on the one side and on the other side an oppositional group allied with the secessionists in the South and with the rebels in Darfur. Although parts of the conflict were formally resolved, the fighting in the region has continued beyond 2013. Food shortages due to natural disasters and new conflicts between rival nomadic tribes led to high civil casualties and an increasing number of refugees. Between 2010 and 2013, approximately 270,000 Sudanese were newly displaced, along with 2.4 million internally displaced (IDMC 2013). In a referendum in 2011, the South Sudanese population decided in favour of secession. In 2013, a power struggle between the President Salva Kiir and his deputy Riek Machar divided the governing SPML party. The emerging conflict led to massive population displacement and a humanitarian crisis. The divisions between the two wings of the SPML continue to fuel the conflict in spite of the 2015 peace agreement.